What Are Greeks Voting on This Weekend? A Q&A With More Qs Than As. 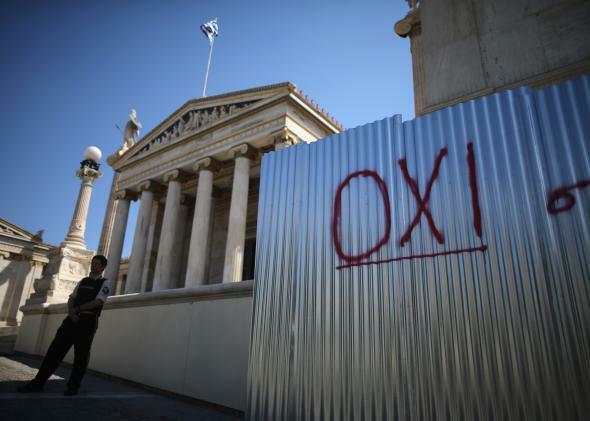 A security guard stands outside the Athens Academy building next to graffiti saying ‘OXI’ meaning ‘NO’ to austerity on July 2, 2015 in Athens, Greece. I’ve heard there’s a big vote in Greece on Sunday. What’s that all about? The Greek government, which is about $350 billion in debt, has been trying—unsuccessfully so far—to renegotiate the terms of an international bailout deal. The “troika” of creditors—the European Commission, the European Central Bank, and the International Monetary Fund—want Greece to enact a series of spending cuts and tax increases in exchange for continuing the funding. Greece’s government rejected the proposal last weekend, with Prime Minister Alexis Tsipras shocking many by announcing that it would put the bailout terms to a public referendum this Sunday. Tsipras seemed to be backtracking on Wednesday, saying he would agree to most of the terms of the deal that he had previously rejected, but by then it was too late. Greece’s European creditors rebuffed his offer and said they weren’t interested in talking until after the vote. In the meantime, the government has shut down the country’s banks into prevent financial panic, and most customers have been limited to ATM withdrawals of 60 euros per day. Haven’t we gone through all this before? Yes. Greece has been passing a series of highly unpopular austerity measures in exchange for international bailout funds since the debt crisis began in 2010. The possibility of a Greek exit from the eurozone has also loomed over the crisis since its earliest days, but so far, the two sides have been able to reach a series of uneasy compromises. A previous Greek government proposed, and then canceled, a referendum on austerity and the bailout back in 2011. Earlier this year, the left-wing coalition, led by Tsipras, was elected, pledging to renegotiate the terms of the bailout, much to the dismay of the country’s creditors. After fraught negotiations, Greece won a four-month extension of its bailout deal in February in exchange for some reforms and cuts, but there’s been little progress since then. So what exactly are Greeks voting on this weekend? It’s a little unclear, including to the voters themselves. Theoretically, Greeks are voting on the bailout terms offered by Europe last week, which their government has rejected. But Chancellor Angela Merkel of Germany, Greece’s most important creditor, says that deal is no longer on the table. So at the moment, Greeks are being asked to vote on a bailout offer that no longer exists. Broadly speaking, the vote will be interpreted as a decision on whether to continue to agree to harsh austerity measures in exchange for bailout funds, or reject the bailout. Syriza is urging Greeks to vote “no.” Other European governments, who more or less openly despise Syriza, see the vote as a referendum on the party’s rule and are pushing for a “yes” vote. Polls show the “no” side with about 57 percent support, but that gap is shrinking and with the government’s own position unclear for now, it’s hard to say with any certainty what the voters will decide. Both sides have held large rallies in Athens this week. If Greece rejects the bailout, do they have to leave the euro? Also unclear. Several European leaders have come out with statements saying that they view the vote a referendum on whether Greece will stay on the euro. As there’s no legal mechanism for an EU member state to pull itself off the common currency, this would likely involve Greece leaving the European Union altogether. But these statements may be a scare tactic: Most Greeks want to stay on the euro, even if they oppose the austerity measures it will likely entail. Tsipras has denied that a “no” vote is a vote for leaving the euro, accusing the country’s creditors of trying to blackmail Greece. German Finance Minister Wolfgang Schäuble complicated the “euro vs. drachma” narrative on Tuesday by suggesting that the Greeks could “stay in the euro for the time being” even if they vote no and may be able to tap some EU funding to help boost the country’s flagging economy. But there’s another deadline looming: On July 20, Greece owes 3.5 billion euros to the European Central Bank. If Greece can’t make that payment, a “Grexit” is probably inevitable. So what happens in Greeks vote yes? Merkel says the offer made last weekend is no longer valid, but most likely Greece and its creditors will come to an agreement to keep the bailout going, along with the accompanying austerity measures—perhaps with some of Tsipras’s proposed adjustments. Depending on how Tsipras’s efforts shake out this week, he might be forced to call new elections, which would suit his European counterparts—especially the Germans—just fine. Finance Minister Yanis Varoufakis, who has led the negotiations, has already said that he will step down if Greeks vote yes. But even with the European life support continuing, Greece’s dire economic conditions will continue for some time. The Greek economy continues to shrink, unemployment is above 25 percent, and 3 million are living on or below the poverty line. The dire economic conditions are contributing to social problems including an unprecedented public health crisis, brain drain as educated Greeks leave the country, and an increase in racially motivated violence. While the Greek crisis has its roots in years of government mismanagement and fraudulent record keeping leading up to the global financial crisis, Greeks also, with justification, blame the European-imposed austerity measures for draining economic growth and exacerbating the social crisis through cuts to public welfare programs. The bailout money is going mostly to finance the government’s debts rather than fund badly needed public programs. Plus, Greece’s euro membership means it can’t simply print more currency, as governments normally do in such situations. That sounds pretty bad. Should I donate to that Indiegogo campaign to help Greece pay its debts? No. That’s not how countries work. OK, fine. So, what happens if they vote no? That’s a lot more uncertain. As I noted above, it’s possible that a way may be found for Greece to hobble along on the euro even after rejecting the bailout. But if it crashes out of the eurozone entirely, it will find itself in uncharted waters. No country has ever pulled out of the euro before and there’s no set mechanism for it to happen. That’s intentional: The common currency only works if it’s very, very hard to drop it. In the long run, it is possible Greece will be better off outside the eurozone. It will be able to once again use monetary policy to boost economic growth and can take advantage of favorable exchange rates for the New Drachma, or whatever it ends up being called. In the short term, it could get ugly, especially if—as seems likely—the changeover happens in an ad hoc and chaotic fashion. Inflation and capital flight are likely and if Greece defaults on both its European and IMF debts, it will be treated as a pariah in international financial markets. A loss of EU membership could hurt Greek access to European markets, and its former partners won’t be in much of a mood to help. Most investors and financial institutions have pretty limited exposure to Greek debt these days and governments have taken steps to limit the risk of contagion. That’s not to say there’s no risk of unforeseen economic impacts of a Grexit, but the chances of global economic catastrophe are a lot lower than they were a few years ago. For now, markets are holding steady after a drop on Monday amid hopes that the two sides might still salvage a deal. The political impacts could be more serious. The European project is predicated on the vision of an “ever closer union” between countries, and a Greek departure would be a serious blow to the long-term push for integration. As Spanish Prime Minister Mariano Rajoy put it this week, a Greek exit would be a “negative message that euro membership is reversible.” That message would come at a time when euroskeptic parties from both the right and the left have been making significant gains across the continent and one major European power—Britain—is planning a referendum on whether to quit the union entirely. While Brussels has gotten an understandably bad rap since the financial crisis, the EU is also widely credited with helping to maintain the post-war peace on the European continent and encouraging the growth of democratic institutions in its new members. (It won the Nobel Peace Prize in 2012.) The prospect of its collapse, however remote, shouldn’t be taken lightly. But obviously, depending on what Tsipras and the Troika can work out this week, we may not have to worry about any of that. Should I cancel my trip to Greece? Definitely not. God knows they need the money and even if everything goes wrong, you’ll probably get a pretty favorable exchange rate on drachmas. The banking controls will hopefully be lifted soon, but all the same, you might want to withdraw some cash before you head over.